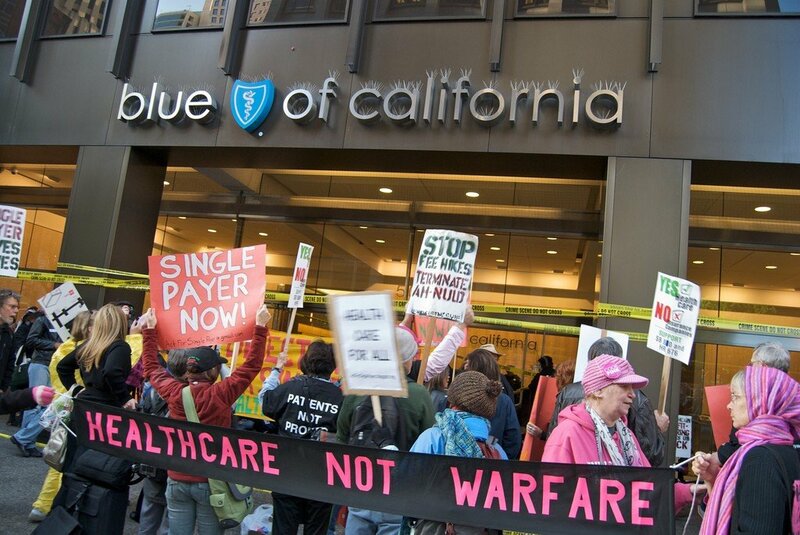 Health care reform protest at Blue Shield of California. Photo by Steve Rhodes/Flickr. Quietly, in August 2014, one of the largest health insurance companies lost their tax exempt status in the State of California: Blue Shield of California. Established in 1938, it’s been well known for years that this company and its real owner, California Physicians’ Service, Inc. (CPS), quietly scooped up billions in tax exempt revenue. They also managed to confound the government even further by calling themselves a Foundation! The California State Franchise Tax Board is known to be ruthless in hunting down fraud. Finally, after decades of deceit, Blue Shield’s tax evasion scam got the axe. But that isn’t stopping Blue Shield, the almighty, from appealing the decision. Should they lose, they are prepared to fall back to continuing as a not-for-profit organization. Watch for another Ivy League accounting move to shelter their billions of stored money, money which they have amassed on top of paying their chief executives billions in compensation while dominating the California medical insurance cartel. Sean Barry, a Blue Shield spokesperson, said the company would remain a not-for-profit even if it doesn’t prevail in its effort to win back its tax-exempt status. What confidence! Blue Shield currently has at least $4.2 billion in financial reserves as of the end of 2014 and has held at least $3 billion in reserve each year since 2009. But they’ve contributed only a fraction of that to its Foundation and paid even less over the years in fines and penalties for sanctions levied against them. It’s always fight, lose and yet still win. Here’s the latest installment in Blue Shield’s storied history. LOS ANGELES (MarketWatch)—Regulatory officials in California have revoked the tax-exempt status of one of the state’s largest health insurers, Blue Shield of California, exposing the nonprofit entity to millions of dollars in annual tariffs, back taxes, sanctions etc. The Franchise Tax Board confirmed Wednesday that Blue Shield, operating under the name California Physicians Service, actually lost its tax-exempt status on Aug. 28. But the revocation didn’t become public until the Los Angeles Times reported the move early Wednesday. Blue Shield has been bilking the public for decades. We’re thrilled the State of California finally caught up with them, but it took some time—they have a deep history of fraud going back decades. Here’s an excerpt from a 1996 Los Angeles Times article, “Blue Shield Admits Faking Audit Reports”. Blue Shield of California has agreed to plead guilty to federal criminal charges that it engaged in a years-long conspiracy to falsify government audit reports on the insurer’s processing of billions of dollars’ worth of Medicare claims, the Justice Department said Friday. The San Francisco-based insurer agreed to pay a $1.5 million fine to settle the criminal charges and faces additional civil sanctions, federal prosecutors said. The government took the unusual step of filing criminal charges against the insurer because the six-year scheme was “so pervasive . . . and a companywide problem,” U.S. Atty. Charles J. Stevens in Sacramento said. The guilty plea—the first ever by a government contractor that processes Medicare claims—follows an 18-month probe by investigators for the Department of Health and Human Services. Blue Shield pleaded guilty to three felony counts that carry a maximum fine of $500,000 each. I Promise to Be A Good Boy! Really? This is like asking Al Capone to stop smoking cigars! Government officials should be given intelligence tests before they’re hired. The fine of $1.5 million for their self-admitted fraud in this case represents a fraction of a fraction of a fraction of a percentage of the $4.2 billion dollars which Blue Shield holds in assets today. So, really, this appears to be a cooked-up bargain. Ah, the brains of our officials in Sacramento. It must be the heat! Well, let’s be kind: 1996 was a long time ago and they probably just forgot. The legal and financial mechanics of how they accomplished their fraud(s) of tax law manipulations which eventually bit them in the behind is so clever and so predictable. There are some zombie lawyers and accountants walking among us. Let us know if you want the dirty details of how they managed this deceit for decades. But not to worry; they are only fined a fraction of a percent of their $4.2 billion reserves. Their CEO of Ross, California won’t be going to bed hungry! And this latest setback isn’t likely to stick as they are bent on remaining a non-profit in one form or another to keep the megabucks flowing. In 2006, Blue Shield agreed to a $6.5 million settlement relating to its alleged modifying of the risk tier structure of its individual and family health care plans. In 2008, the organization agreed to a settlement with the California Department of Managed Health Care to resolve allegations of improper rescission of individual health plan coverage. Blue Shield agreed to pay $3 million as a penalty. There are many, many other examples of Blue Shield fraud. But little seems to keep them down. The good news is organizations like Blue Shield that claim to be tax exempt are coming under scrutiny. The amounts of money which are essentially paid by the tax payer for their clever accounting and deceit represent a significant opening to get these sham tax-exempt organizations to pay and hopefully make a contribution to our national and state debt. It is, however, interesting to point out, that the executives involved in fraudulent schemes never see the inside of a prison cell. Like the Wolves of Wall Street they are instead rewarded for their duplicity with additional contracts, money because they are too big to fail, and other door prizes. Their political clout obviously buys special treatment. The average Joe would be in the slammer. But the door is open to nailing more and more of these creative corporate criminals and their accountants. Let us pray! Perhaps if we keep the public informed and the pressure turned up on this kind of societal insanity, our tax bills will go down and these slick tricksters will do some hard time.